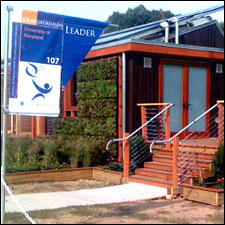 The University of Maryland's entry into the 2007 Solar Decathlon took 2nd place at the conclusion of the competition in Washington, D.C, behind the Technische Universit�t Darmstadt of Germany. UM won the BP Solar People's Choice Award. The UM team won the subjective lighting, energy balance and communications contests during the competition and took second place in the architecture, lighting (overall) and market viability portions of the decathlon. There were also contests involving how the team's house supported appliances, produced hot water, powered a solar car and how comfortable the house was. The team placed 6th in the engineering portion of the competition and was one of seven teams to have a perfect score in the "energy balance" segment of the competition. In other contests at the event, the UM team took first place in the National Association of Home Builders' Marketing Curb Appeal contest and also was recognized by the American Society of Heating, Refrigeration and Air-conditioning Engineers for "Integration for Renewables for Sustainable Living." At a separate event, the Potomac Valley chapter of the American Institute of Arhictects gave the team its Advancement of the Art and Science of Architecture Award. The team's entry, LEAFHouse, uses the Chesapeake Bay watershed as the inspiration for a smart, adaptable, resource-efficient home powered by renewable energy. "LEAF" stands for "leading everyone to an abundant future." According to the team web site, "The name 'LEAFHouse' reflects our interest in the elegant marriage of biological knowledge and cutting-edge technology. The leaf in nature is a perfect machine for converting sunlight into energy." The UM team was made up of students from several schools on campus, including engineering and architecture. This is the third time UM participated in the Solar Decathlon, organized by the U.S. Department of Energy's Office of Energy Efficiency and Renewable Energy. Read/watch the U.S. Department of Energy press release online.